The iconic Paul and Kay Selzer House — which architect Hugh Kaptur has said is the best home he ever designed — has just come on the market. The singular architecture of the home is just as distinct when viewed from the backyard where the pool has its own sculpted pyramid. The Palm Springs Preservation Foundation will be the lead sponsor for the upcoming exhibition “Hugh Kaptur: Organic Desert Architecture” that will open Feb. 2 at the Palm Springs Art Museum’s Architecture and Design Center. The twin pyramid-shaped rooflines and three sculptural chimneys distinguish the striking exterior of the Paul and Kay Selzer Residence. The Selzers had asked Kaptur to design a Mediterranean-style French Provincial home, so they were more than a little surprised when Kaptur presented them with a model Kay described as “Mexican Modern.” The twin pyramid-shaped rooflines and three sculptural chimneys distinguish the striking exterior of the home. A third, smaller, open-air pyramid hovers over the entry courtyard. The guest casita features a large living area and one bathroom. It could also be used as a pool house. 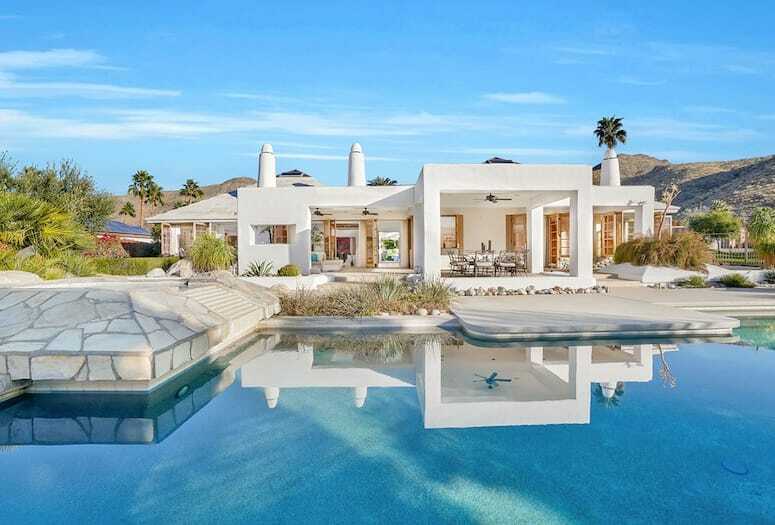 The half-acre property comprises almost 4,500-square-feet of living space in four bedrooms and five bathrooms, including a separate guest casita/pool house that was built several years after the main residence. Other unique features include vaulted, wood-clad ceilings; three kivi-style fireplaces; a sunken living room; beautiful, smooth stucco walls with architectural niches; a large, open kitchen with an island and prep sink; a covered outdoor living area; a pool, with its own sculpted pyramid; and French doors that open to panoramic views of the San Jacinto Mountains. 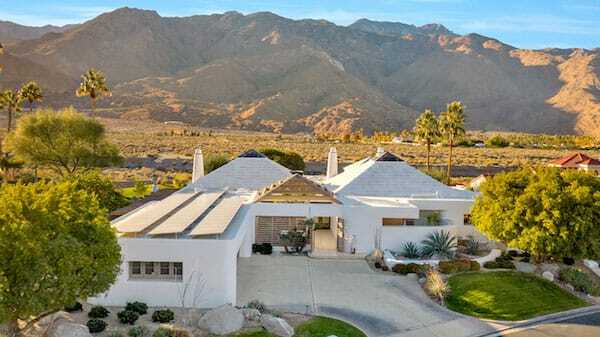 The property is located in the quiet, gated community of Parc Andreas in South Palm Springs. 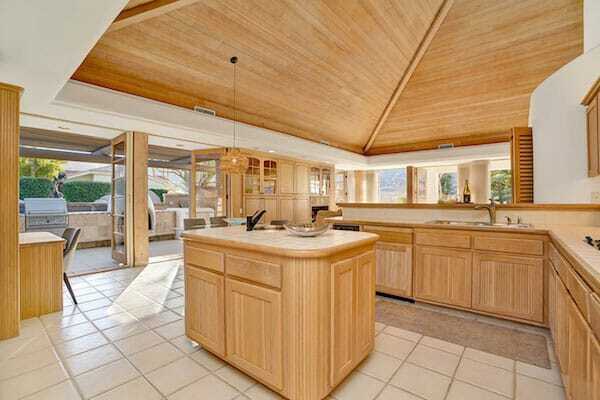 The open, airy kitchen is one of many rooms in the home that has a vaulted ceiling clad in rough sawn wood planks. One of three kivi-style fireplaces is in the sunken living room. Located within one of the pyramids, the scale and volume of the master bedroom is truly unique.